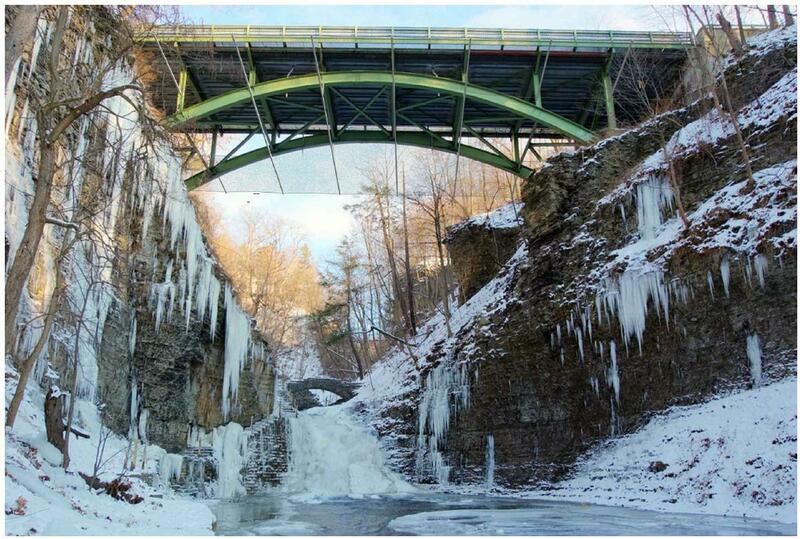 Sometime in the fairly near future, Cornell will begin to install the safety precautions on the campus bridges. For the most part, I have avoided discussion about the proposed “means restrictions”. While technically an addition to the physical plant, they didn’t stand out enough for me to really discuss them in great detail. Which isn’t to say the reasoning behind their construction isn’t very important. Or that the process involved in their design went smoothly, since the architecture firm designing the add-ons became embroiled in internal conflicts. Some of the bridges, like the Stewart Avenue and Thurston Avenue bridges over Fall Creek, have means restrictions that basically consist of some metal bars extending out from the supporting arches with some nets rigged on top. 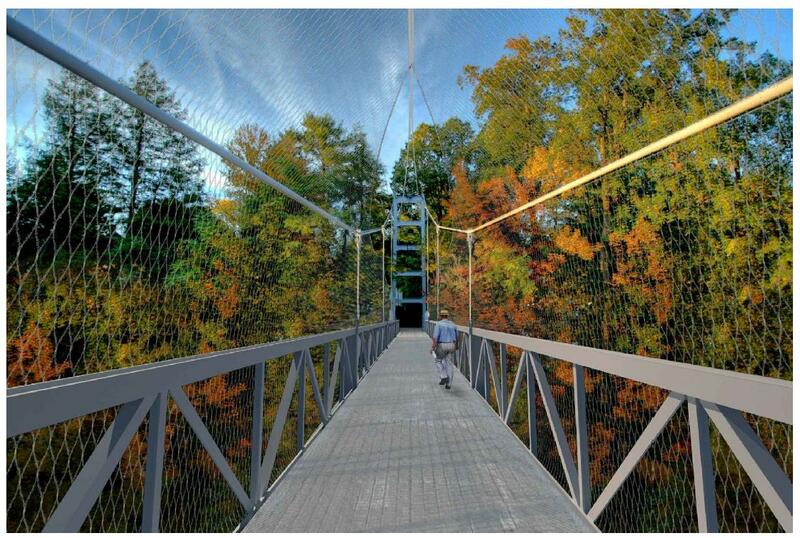 Others, such as the Suspension Bridge shown above, are a bit more creative. I used to walk over this bridge virtually every day, so seeing it cocooned doesn’t appeal to my aesthetic senses. For the most part, bridges that are considered iconic or to have iconic views are left with few visual obstructions above level. 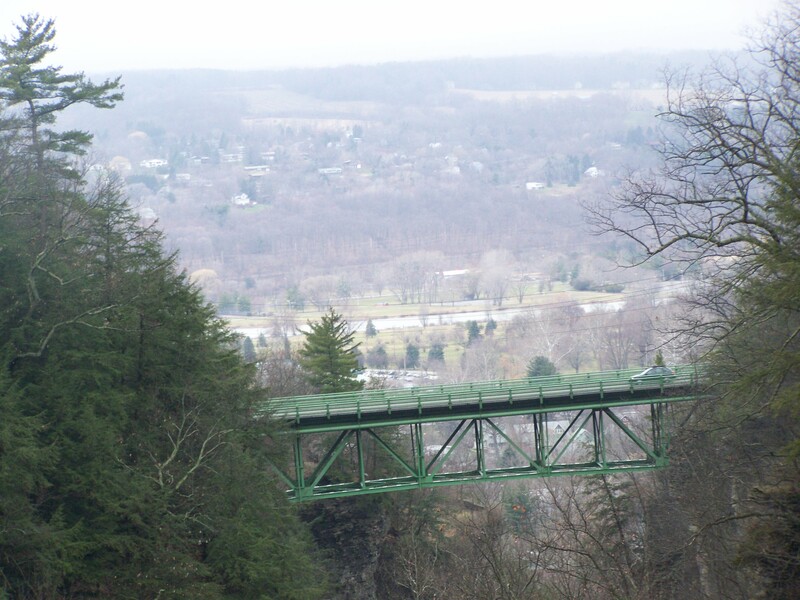 For instance, the Stewart Avenue bridge over Cascadilla Gorge. For those who enjoyed looking through the slats into the churning waters 100 feet below, it looks like those views will be only partially obstructed. I for one discovered the best way to find out if someone has a previously unmentioned bridge phobia is to attempt to have them walk over this bridge, and then when they freeze up halfway, walk them through as they clench their eyes shut and shuffle forward while you hold their hand. That was only time my mother ever visited Cornell outside of my graduation. Looking through the full set of documents, it would appear the cost of the “means restrictions” comes out to just under $4.9 million, and all construction projects are expected to last two months. Will it bring an end to the gorge jumpings? If the distraught individual has to work harder to do it, perhaps. Falling 15 feet into a stainless steel mesh net probably isn’t going to do any favors to ones health, but at least it won’t kill them. Will it bring down the suicide rate? Debatable. Studies have shown it can decrease or go unchanged. But given the all the bad press that Cornell has received, and the ongoing $180 million lawsuit from a parent of one of the deceased, I suppose Cornell can’t afford to sit on its hands. From Cornell Daily Sun. Image Updated 4/25/2012. Site Plan Review, Townhouse Apartments, 107 Cook St., Jason Demarest, Applicant for Owner, Dan Liguori. 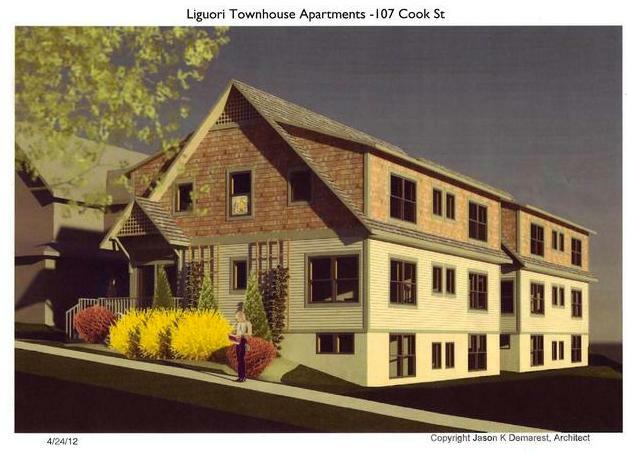 The applicant is proposing to construct two 2‐story townhouses with partially finished basement levels, four parking spaces, and asphalt‐paved access drive, walkways, and landscaping. The buildings are each 2,304 SF with 6,128 SF finished floor area, and contain two 3‐bedroom dwelling units, for a total of 4 new units with 12 new bedrooms. Proposed exterior finishes include brick, fiber cement board, cedar shakes, and stained wood lattice detailing. The project is in the R‐2b Zoning district. This is a Type I Action under the City of Ithaca Environmental Quality Review Ordinance and the State Environmental Quality Review Act (because the site is contiguous to a historic district) and is subject to environmental review. If the address looks familiar, it should. The ca. 1912 house that stood on the property was engulfed in flames in May of last year, killing a Cornell student. One of the factors that was believed to have weighed in on the fire (which was accidental) was a confusing internal configuration due to subdivision of the original property from single-family into multiple tenants (there were eight units total, housing 13 students). The first proposal for new development on the property was rejected for a couple of reasons – for not having a porch, and for having a mansard roof that wasn’t much of a mansard roof. The planning board has been fairly adamant that any new property on the street fits in with the current set of buildings. Well, that and fire safety. Old single-family houses that are subdivided are usually grandfathered from the sprinkler requirement as long as the alterations are strictly internal. The new building would have to have a sprinkler system in order to be approved as a multi-tenant building. So here we are on proposal two; townhouses, two units in each, 12 bedrooms, so two bedrooms less than the previous proposal and one less than the original building. Based off of description alone, with cedar shake and wood lattice detailing, it sounds like this structure is more in-line with the current style of buildings on Cook Street. I for one will be curious to see how it looks. 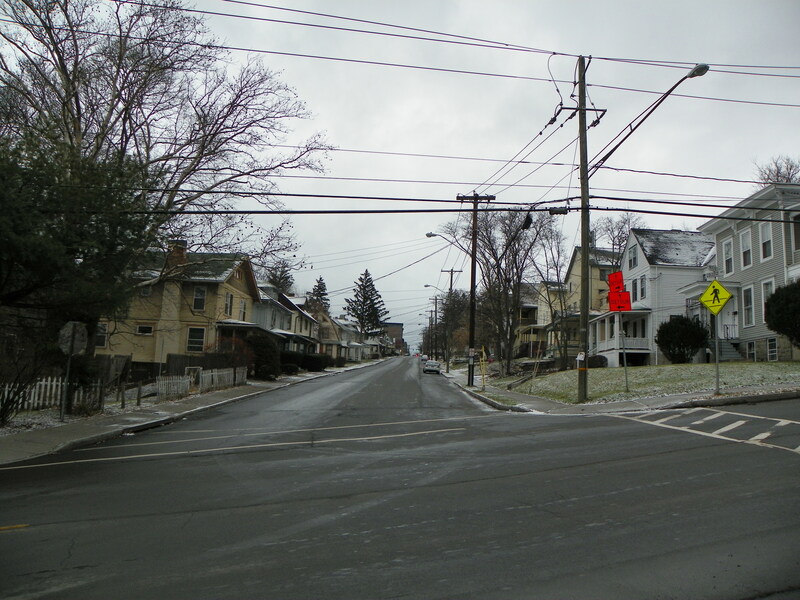 Arguably, from a purely financial standpoint, it would be a blunder to not redevelop the property – several new units close to Cornell would fetch a higher going price than neighboring houses, just for being newer and safer. Also, paying taxes on land as highly valued as Inner Collegetown’s probably dissuades the owner from sitting on the property. If one were planning on holding onto the parcel for the long-term, this could be a potentially lucrative setup for the small-scale owner/developer. Taking a grander view, I wonder if projects like this could be a demonstration of what may lie ahead for some smaller Collegetown properties. As large new developments open up (CTown Terrace, the Palms proposal, etc. ), and assuming a static student population, the rates for older unrenovated buildings will go down and the owner’s revenue will take a hit. This will be further compounded on poorly-maintained properties; owners who suddenly have a building declared unfit by the city, and have to make costly repairs or rebuild (while being excoriated by local residents and officials). Ii is possible that over the next decade or so, more projects that seek to build smaller but student-specific properties will be proposed in the area. Quality of design and materials, of course, is up to the owner and requires the city’s approval. In summary, I see the redevelopment of 107 Cook as an illustration of what may lie ahead for Collegetown. …and by Orthodox Greek, I mean your normal Cornell Greek house. But I enjoy a little bit of word play. I had come across a piece in my Cornell feed about a Christian house at Cornell on The Knoll called “Chesterton House”. I thought it was unusual that I had never heard of it, but I wrote it off as being some low key residential organization, like many at Cornell are (for example, Telluride, the Co-Ops and a few of the professional fraternities). I noticed its location was 115 The Knoll, which failed to ring a bell – I thought it was a rowers’ house or home to some of the Big Red Band. I’ve been vaguely aware that there were five houses on the Knoll, so there was bound to be some non-Greek component. 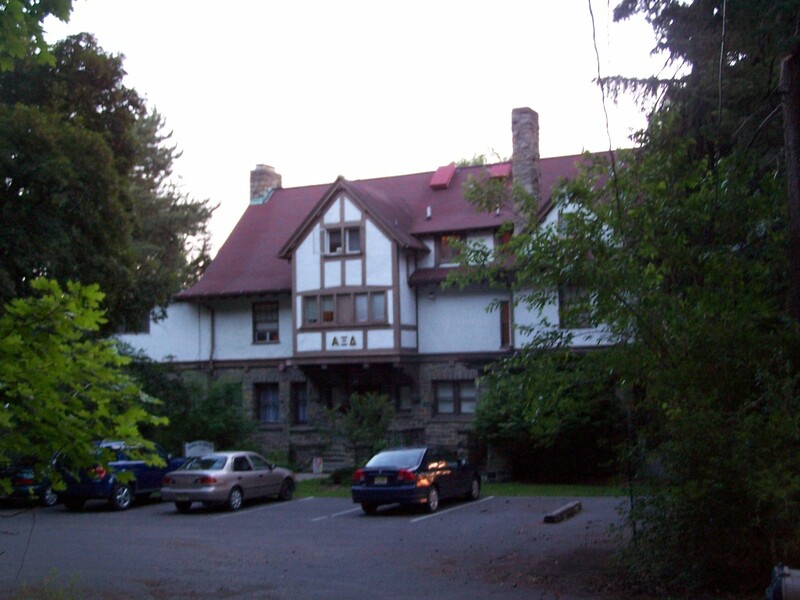 Then I glanced at their website – it’s Alpha Xi Delta’s old house. The one I profiled a couple years ago. According to their website, the house is named for Gilbert Keith Chesterton, an early 20th century writer and “defender of the Christian faith”. The house holds 15 and is all-male, with the female equivalent being Sophia House at 315 Thurston, the house with a stucco finish and the extremely high-pitched tile roof. Apparently that house is being rented, so it is not under the organization’s possession. Now, the house on the Knoll is owned by Delta Phi Epsilon sorority, the last I checked (for the record, they’ve owned it since 1962). So I’m going to venture that this is a fairly recent endeavor, and a big step for an organization that was established only 12 years ago. Although a relatively young organization, it’s certainly garnering its share of alumni support. I for one welcome them to establish themselves as one of the many opportunities afforded to students at Cornell. In my mind, I see it as something similar to the Jewish Living Center on West Campus. My one encouragement is that they adopt a policy similar to the Jewish Living Center and encourage freshmen to live with the other freshmen. I’ll willingly admit that as the brother of a fire-and-brimstone evangelist, I’ve been wary of religious groups in general (one tends to be that way when your sibling tells you you’re going to hell at every Thanksgiving dinner, for being a secular Christian). But it’s also addressing a niche group at Cornell and offering more for some individual’s Cornell experience.